Go back 20 years or so, and Playa del Carmen was little more than a fishing village on one of the most beautiful stretches of beach along this coast. Playa then grew into a haunt of backpackers, scuba divers and privacy-seeking Europeans put off by Cancun's high-rise resorts. And, although it does still attract those visitors, it has now blossomed into a full-fledged tourist destination complete with its own luxury resorts, dozens of restaurants and enough clubs and music venues to keep night owls occupied for weeks. However, its central position between the tourist hotspots of Tulum to the south and Cancun to the north has led to rapid, unchecked development. Where once the village was contained, stretching just a few blocks from the main ferry terminal and the beach, today there are hotels and resorts completely surrounding the town for miles in both directions. Despite its sudden popularity, though, Playa del Carmen clings firmly to a laid-back atmosphere that's missing from Cancun. You won't find any glass and concrete behemoths here; three-story buildings are the tallest the law allows, and many structures are still made of stucco or rough wood, some sporting a thatched roof and others sheltered beneath layers of red clay tiles. 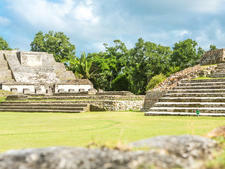 Local Mayan culture and history are prevalent here as well, infusing some parts of town with a rustic yet exotic charm. Beach bars and T-shirt shops might dominate portions of the landscape, but walk a mere five minutes away from the main tourist area and you'll find yourself in a quiet neighborhood surrounded by brightly colored houses with wrought-iron doors, immaculate gardens and multicolored flowers cascading down from their balconies. Venture a little further outside the city limits and you'll see that Playa del Carmen's modern amenities are really just a garnish. The main dish is the town's proximity to important historical and ecological landmarks, including several stunning collections of Mayan ruins, two eco-archaeological parks and thousands of cenotes, the systems of hidden caves and natural springs, which ancient Mayans regarded as doorways to the spiritual world. After spending an afternoon in the area, many visitors find it easy to believe that the entrance to heaven does indeed lie right here in Playa del Carmen. Strolling along Fifth Avenue can be exhausting -- the amount of times you'll be asked if you want a massage, or marijuana, to come into a restaurant, to change money or buy generic drugs -- is tiring. Sometimes the easiest thing to do is walk along the beach instead. 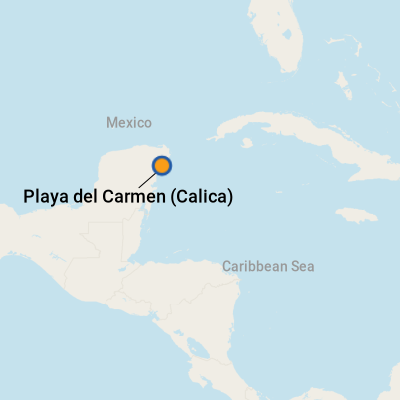 On Foot: The ferry terminal is at the far south end of Playa del Carmen. Walk across the town square and you'll find yourself at the beginning of Avenida Quinta, the main thoroughfare. By Taxi/Colectivo: You'll find taxis lined up beside the main bus station. An alternative and cheaper option is to jump in a colectivo, which is basically a shared taxi van. The driver waits until the van fills up, and then drops each passenger off at his or her desired stop. By Bus: The main bus terminal is a two-minute walk diagonally across the town square from the ferry terminal. Here, you'll find buses to Tulum, Chichen Itza and further afield. The Mexican peso is the official currency. However, most taxis and vendors will accept U.S. dollars, and guides are happy to be tipped that way. That said, your change will be given in pesos regardless. Credit cards are not generally accepted in small family restaurants or tiny shops, so ask if you're not carrying cash before you sit down or start browsing. Several large banks are located on Juarez Avenue, just a few yards away from the ferry dock. Hours of operation are typically 9 a.m. to 5 p.m., but 24-hour ATMs are common. You'll also find plenty of currency exchange booths in the area, some of which stay open as late as 10 p.m. For current currency conversion figures, visit www.oanda.com or www.xe.com. Spanish is the official language in Mexico, though English is widely spoken in shops, hotels and restaurants. Despite the fact that it is a touristy destination, Playa offers plenty of high-quality food. There is some great local seafood to be had, as well as fine cuts of meat. There's definitely no shortage of places to eat either -- a whopping 1,101 choices, according to TripAdvisor. Most of the town's restaurants are located on or near bustling 5th Avenue, and as a general rule the places closest to the ferry dock are noisier, more crowded and designed for tourists. As you walk north along the pedestrian-only street, or off it toward the main highway, the crowds seem to melt away and you'll find unique little places with a wider variety of cuisine, including fusion restaurants that combine local Mexican fare with Italian, Asian or Mediterranean influences. It's a tough choice between a classic margarita or a straight shot of tequila. Whichever you go for, you'll find a multitude of establishments serving them along Avenida Quinta. All the main shops are along La Quinta. Be warned: There is an awful lot of knickknacks on sale here in cavernous stores, including novelty beach towels, tequila shot glasses and Mexican hats. You'll find the quality goods in the smaller shops, including handmade arts and crafts such as hammocks, jade jewelry, ponchos, carvings and leather goods. Tequila and mezcal are everywhere and, with competition fierce, you'll be able to get reasonable prices. You'll also find coral, starfish, packs of shells and endangered fish such as puffer fish for sale: Don't buy any of this. Though there are dealers wielding government-issued permits to sell the stuff, coral jewelry is listed on the U.S. Department of State's list of "wildlife and wildlife products" to avoid. Buyers risk confiscation and fines, quite apart from the environmental considerations. Shopaholics of all types can have a field day shopping at the Cozumel cruise port and nearby San Miguel. If you'd like to pick up a branded souvenir, just stick to the two open-air shopping malls adjacent to Cozumel's three ports. You'll find Senor Frog's, Margaritaville and Pirana Joe stores selling all manner of branded merchandise, a Diamonds International and Colombian Emeralds and a number of stores selling overpriced trinkets and "authentic" Mexican goods. But what if you're after something a little more local and authentic -- handmade in Mexico, rather than China, for example? We recommend heading to the Mercado Municipal (Calle Dr. Adolfo Rosado Salas), about a 10-minute walk east of downtown San Miguel, the biggest town on the island. It's the best place to pick up local goods at significantly lower prices than you'd find in the main street Quinta Avenida, just off the town square. 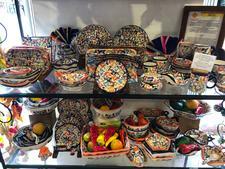 No matter which type of shopper you are, here are nine of the most popular souvenirs and our advice on what's worth buying when you go shopping in Cozumel. Editor's note: There are a few natural items that you do not want to buy in Mexico because they will be confiscated on your return to the United States (or possibly before that, upon your return to your ship). These include coral (particularly black coral, which is endangered), turtle shells and any marine life, such as pufferfish and starfish. New cruisers might argue that the entire Western Caribbean feels exotic -- and longtime travelers might suggest that no cruise port in such a touristed area of the world could possibly be dubbed mysterious or intriguing. Regardless of where you stand on that debate, the truth is when the cruise industry talks about the exotic part of the Western Caribbean, it means the eastern coast of Central American countries Belize, Nicaragua, Honduras, Guatemala and Costa Rica -- set in contrast to the standard Western Caribbean destinations of Jamaica, Grand Cayman and eastern Mexico. Though the countries of Central America share many attributes, there are differences, and those differences can be handy to know when it comes to planning your cruise. For snorkelers, Belize tops the list; divers will also want to include port calls there, but Roatan and the other Bay Islands of Honduras are world-class dive sites as well. Belize, Honduras and Guatemala are ground zero for the ruins of Classic Mayan civilization, most notably Guatemala's Tikal and Honduras's Copan, though Tikal is also offered by some ships as a shore excursion from Belize City. Farther south, Nicaragua and Costa Rica are meccas for ecotourists seeking close encounters with rainforests, volcanoes, white water rivers and wildlife (monkeys and parrots and crocodiles -- oh my!) Read on to find out when to book a cruise to the ports of the Exotic Western, which lines you can take to get there, and where to go and what to know when you dock. 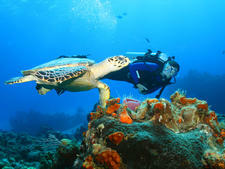 If you're cruising the Western Caribbean and you're also a snorkeler or diver, you're in luck -- the region boasts some of the most diverse underwater marine environments in the Caribbean. Ports of call like Georgetown, Grand Cayman and Cozumel are minutes from some of the best sites for everyone from the novice snorkeler to the seasoned diver who's looking to add some street cred to his logbook.